The cave seemed safe. That’s why I suggested to others, that we should look further. I could not then know, what I’m doing wrong. We just made a few more steps, when we were overwhelmed with the sound of falling rocks. But it was not caving. This was sound, when goblins swarmed us from behind. Dozens of them died under our swords, but we were still forced to back deeper and deeper into the darkness. Roy began to bleed first. We grabbed him and still trying to deflect continuing onslaught of bloodthirsty enemies. There was no doubt, that they desire our gathered treasures. Gold, we have collected on our path. But then I was hit by an arrow. He swayed as not only Roy, but also a bag of loot fell to the ground. Green monsters suddenly stopped and waited. I stood in short distance from the pile of gold, but I turned around and I left them all there. Bag and my friends. To this day I blame myself for it, but I can never atone. Do not make the same mistake. 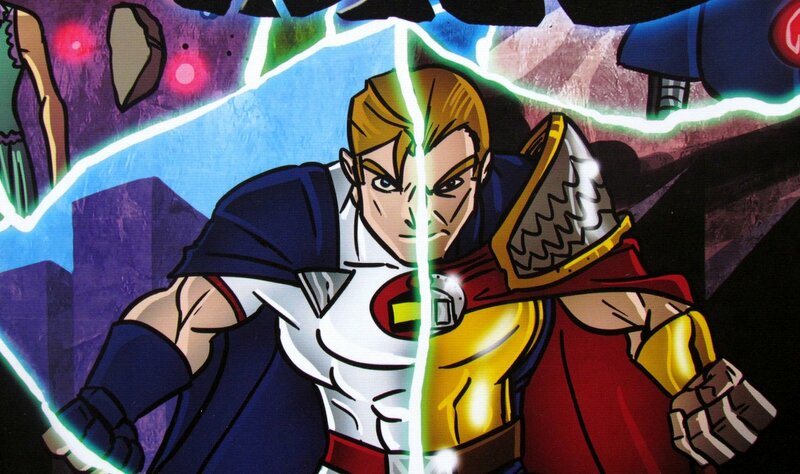 Whether you are the bravest hero, you always have to know, when its the right time to get on the return trip. 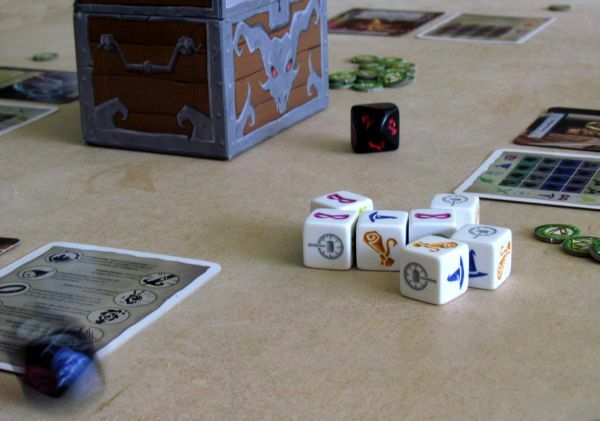 It certainly teaches us board game Dungeon Roll, which was published by Tasty Minstrel Games in 2013 with the help of Kickstarter. 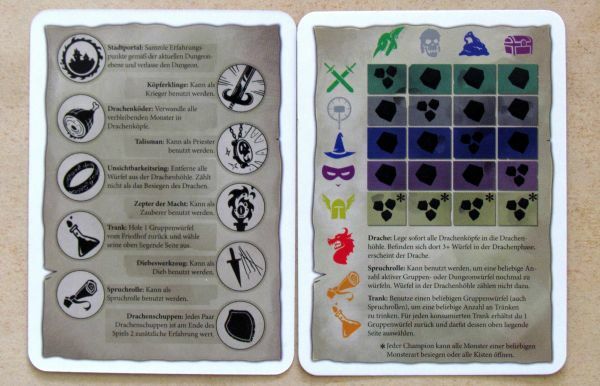 We had a chance to test the German version thanks to the kindness of the company Pegasus Spiele. Author of the game is Chris Darden, illustrations on the cards were prepared by Eric J. Carter, Ryan Johnson and Rob Lundy. 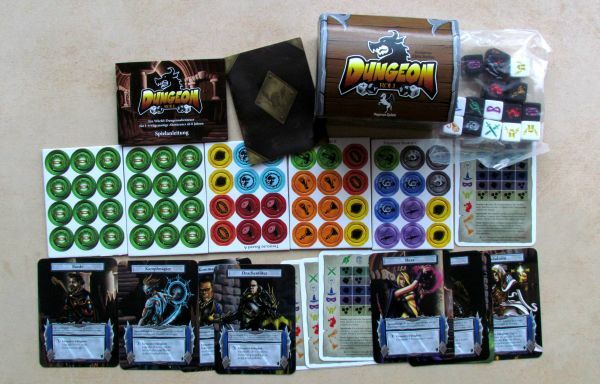 Dungeon Roll does not pretend to be something its not, because it is a simple dice entertainment, which is quickly over. However, against all expectations, game is not found in a classical box. Instead, all components are hidden in a stylish cardboard chest with hinged lid. Its sides are decorated with a dragon symbol, which is echo of things to come. But before you get to him, you will encounter a number of small tokens. They serve not only as treasures, you will be searching in role of adventurers, but also as evidence of experience points. The box has also twelve cards. Four of them contain help and are printed in extremely small font. 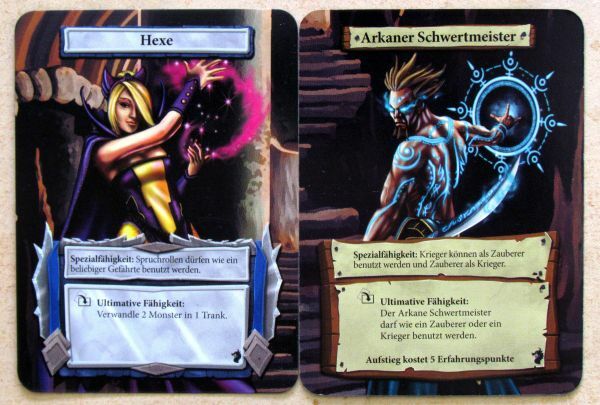 The rest of cards is reversible, but you can find portraits of heroes on them. And you can become any of those. Each is available in two levels – rookie and veteran. 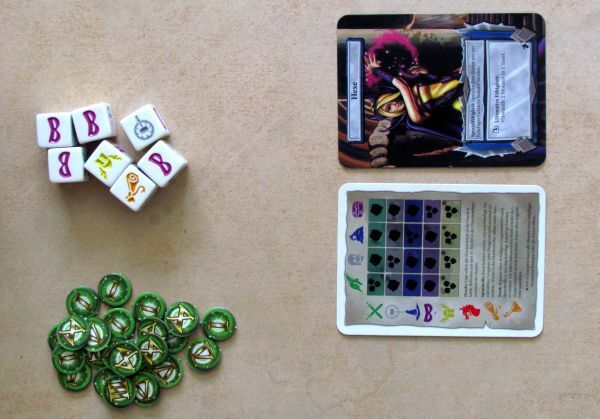 Packaging contains not only rules and cards, but also the main component – dice. There are white for heroes and black for the evil one and one ten-sided on top of it all. 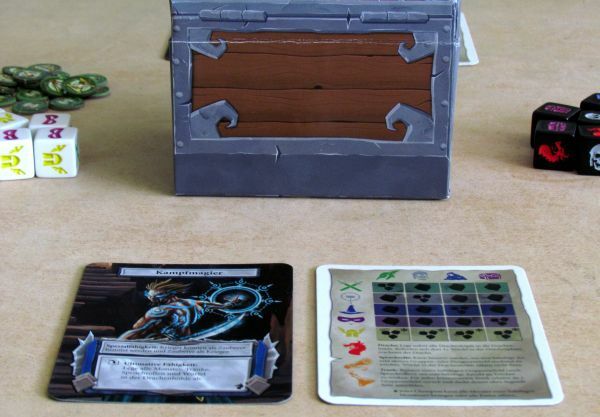 At the beginning of the game, you let the chest lie on the table with treasure tokens hidden in it. Each of the party gets their hands on one hero card and puts it in front of himself with rookie side up. In each round, one of the players becomes an adventurer and his neighbor to the left take over dungeon for the moment. Each of them gets appropriately colored dice into possession. 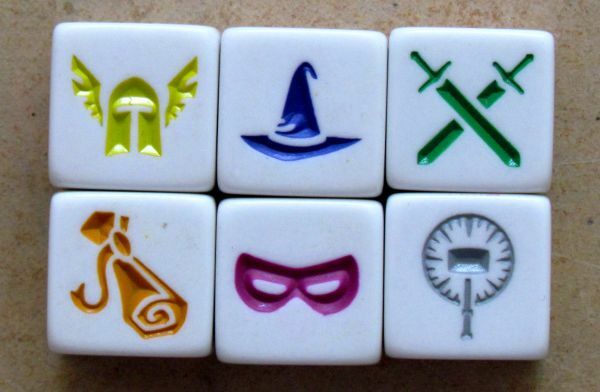 All heroes start visit to the caves by throwing seven white dice. His opponent sets the level of the cave to one on a ten-sided die and rolls exactly one die to determine monsters living on the first floor. 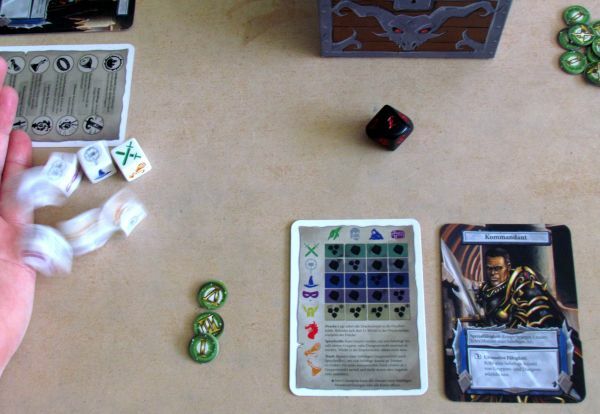 Adventurer uses results of his dice to beat representatives of evil. He can use rolled symbols to attack or reroll any of them. Each of the warriors is better to fight with different types of opponents, for example cleric can defeat any number of skeletons standing in his way, but only one goblin. 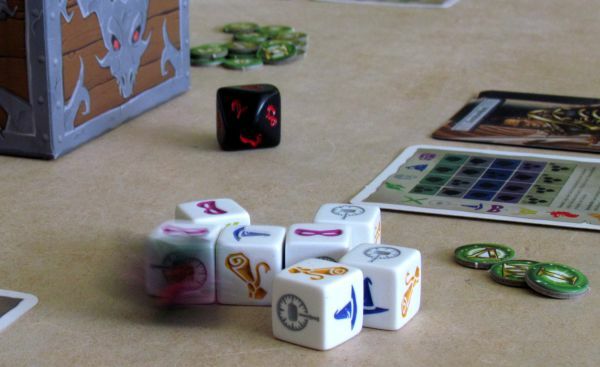 It is up to the player, if is he able to make good use of his dice. 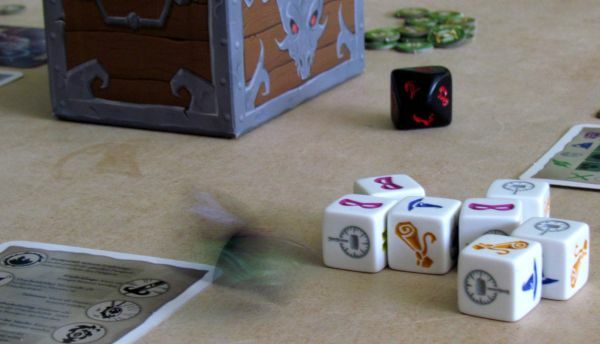 In addition to enemies, you can also find a chest on black dice. And these may contain a reward. To be able to open it, you must first clear the room of any monsters and then use a thief or a champion to break it open. 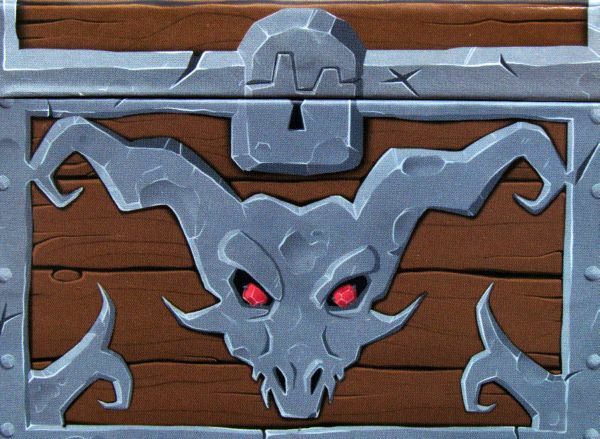 As a result, you can draw blindly one token from the chest, in which you left them at the beginning of the game. 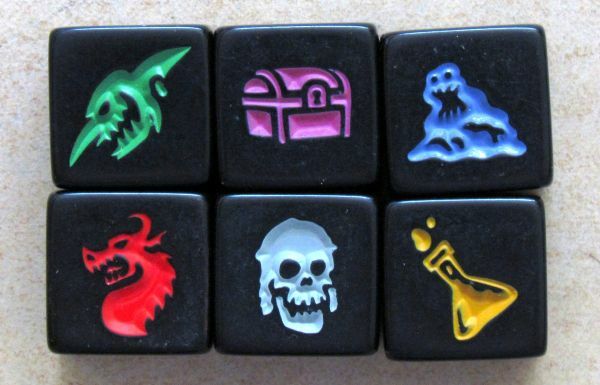 Each dice used in combat or for other purposes must be put into a graveyard. From there, it will return only at the end of the trip or in case you use healing potions. After victory over monsters, you can decide, whether you continue in your exploration or you grab accumulated experience and return to the surface. In case you overrate your strength, you will lose everything you have accumulated in this adventure. 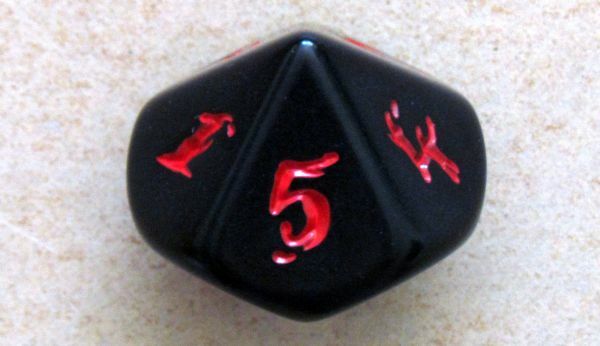 With each new floor, current dungeon master increases number on the dice by one and rolls dice accordingly (one more, than last time). 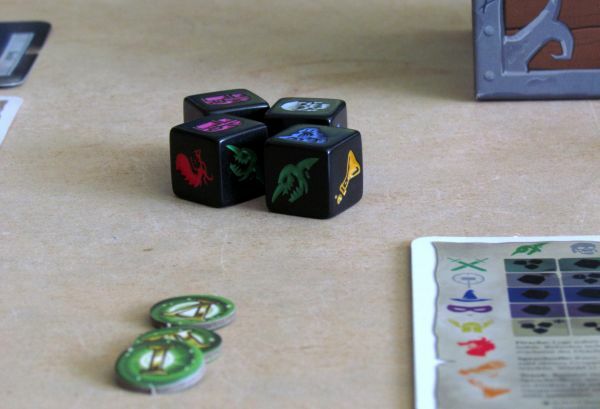 Each dice also contains a dragon symbol. Your hero makes noise, that eventually attract the fiery monster. This happens, once there are three icons with a red dragon head on the table. Now its too late to run away. Brave warrior gets so much experience (tokens with the corresponding Roman numerals), as number of floor he managed to conquer. This means, that next player in clockwise direction becomes guardian of the cave. Likewise moves also role of a hero. Game ends, when all players have completed three expeditions. Winner is the one, who accumulated the most fame (experience) for his actions. 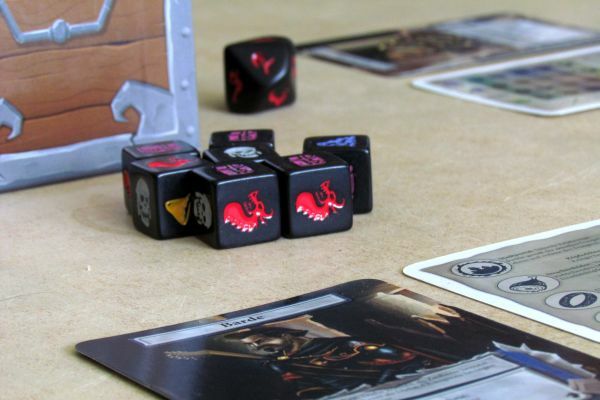 Dungeon Roll is a fun and simple game of dice. 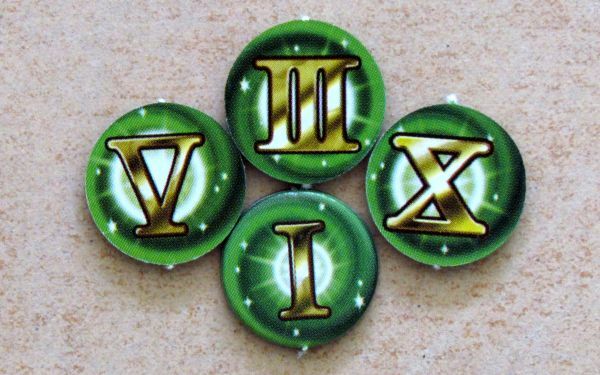 You may not expect deep experience from it, just a simple rolling of dice and wishing for a little luck. It provides the easiest and fastest way to go into a dungeon and cannibalize some monsters, that we have encountered by now. Success depends on risk, players are willing to undergo. Most of the time, you know in advance, how big is a chance of humiliation in the next level. Above all, you must pay attention to dragon symbols, because duel with him is certainly no easy-going meeting. Timely withdrawal from the descend does not depend so much on luck, but also on your estimate and ability to evaluate real chance. Still, there is a irreplacable spot for luck in this game, but not as significant, as you might think. Interestingly, going deeper very often is not worth the risk. Profit for cleaning up one more floor is only one extra point of experience. And that’s sometimes not worth it, when you consider, that you could lose all points and significantly zoom out on a chance to win. Best rewards for heroes are treasures, that are taken out of a chest. But you need to have one on black dice. This chance is increasing, as you get deeper and more dice are rolled. 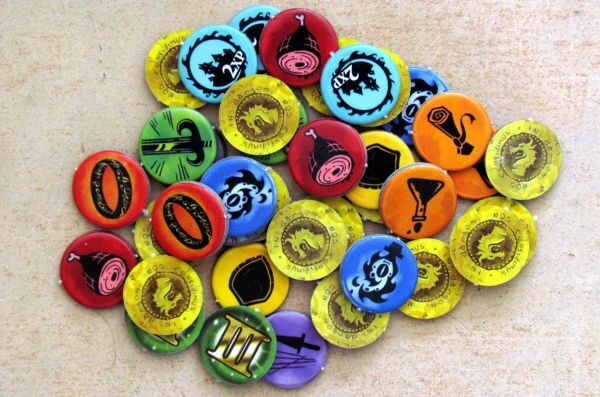 However, these gathered tokens from chest can also be used for its one-time ability, although it’s usually not worth it. These are more valuable to keep until the end. 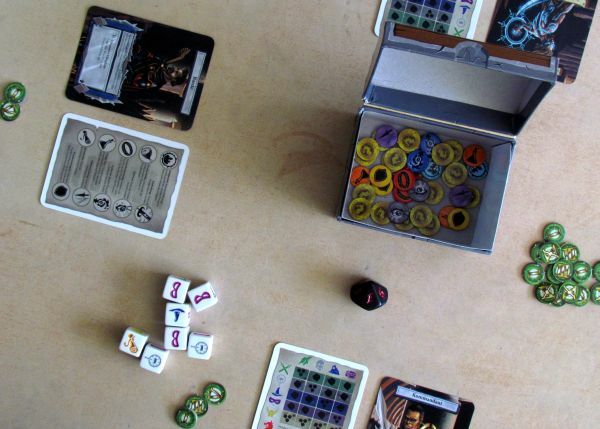 With two players, Dungeon Roll does not work better. Although there is some shortened game time, unfortunately reduction in players also significantly increases the impact of failure on the outcome. 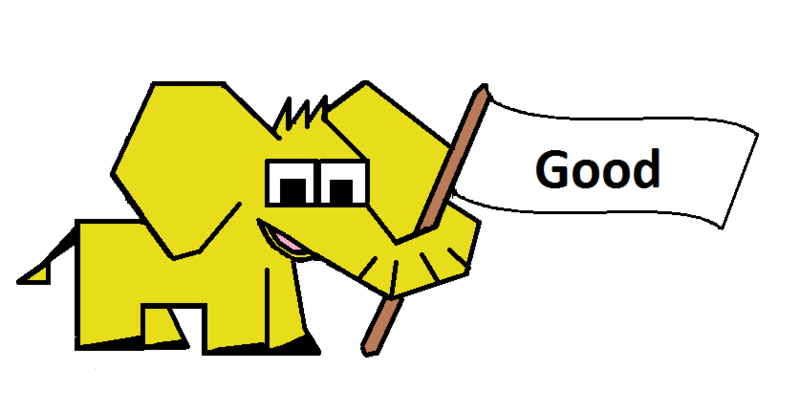 Once a player makes a mistake and loses to forces of evil, game is virtually decided. The other one could play only a careful descends and secure his victory. Conversely, with larger number suits the game well, but do not overdo it. 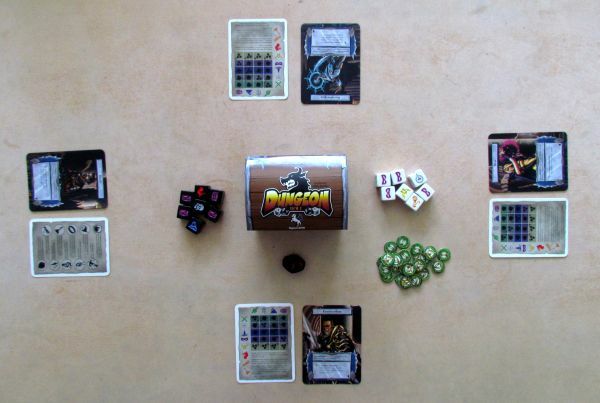 With five people, there is already really unnecessarily long downtime, despite the fact, that two players act during each turn and not only one, as usually. You must wait for three dives, before you get to your turn again and that is unnecessarily long for this simple game. It remains extending, while you participate actively in at least half of the time. Otherwise, you have nothing else to do in your turn. No planning is possible. Otherwise, the game time Dungeon Roll lies really low and is quite favorable, if you’re playing in three or four players. These numbers demonstrated best experiences for us. Whole game is about fifteen minutes long, which is perfectly appropriate time for such a simple dice adventure. 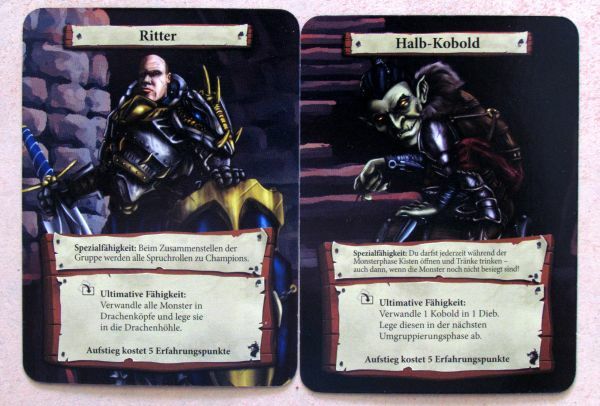 Most cards contains through nice illustration also some added text, printed in really miniature font. Many people do have a problem with reading it. Nobody is holding cards in secret, but players with vision impairments will be hardly looking for some information themselves on help cards. Due to the simplicity of the game, this error is really unnecessary. 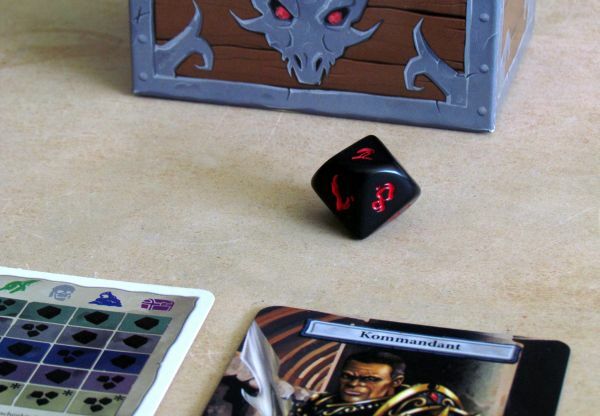 Dungeon Roll is undemanding dice entertainment, that you play, if you have just a few minutes to spare. It takes only a little space and you can take it with you anywhere. Its suitable for combat, while waiting for the train, but also for live entertainment in the restaurant. Significant element of waiting for your opponent’s move easily disappears in such environment, because game here is an addition to social event with a glass of good drink. 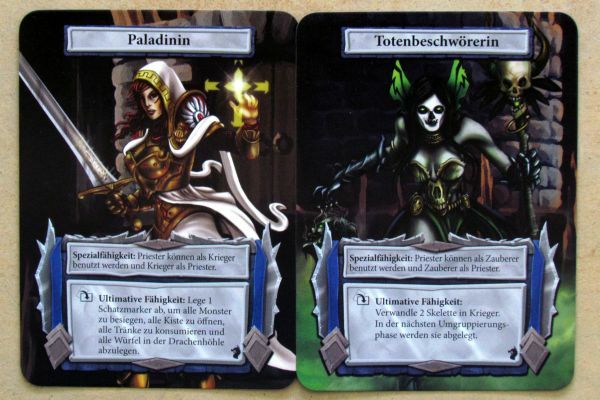 Dungeon Roll performs exactly the role, that you would give it. If you like light dice games, this is worth picking up despite some flaws. 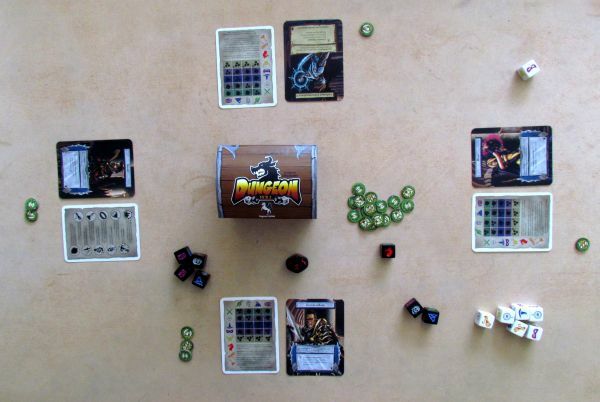 Dungeon Roll is a dice relaxing game, that offers dungeon crawl with the help of dice and all this within fifteen minutes of game time. 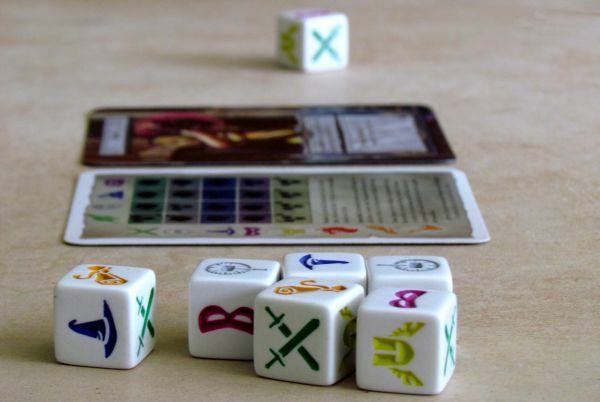 A simple attempt to explore as many cave floors as possible with a limited number of dice clearly plays an string to your capability and force you to end your attempt at the right time. Game is nicely balanced until the end without known winner, if players do not take needless risks. Biggest problem remains in idle time, which increases with number of participants. Therefore, it is best with three or four players. It fits well into any backpack and can be played anywhere with anyone, even in situations, where you do not fully concentrate on playing, while you still want to enjoy feeling of victory. 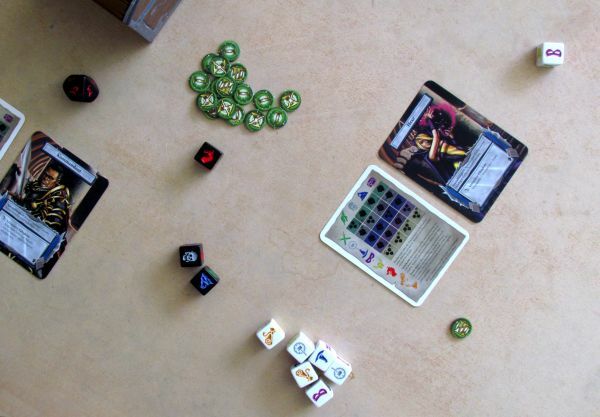 Dungeon Roll is a light fun for everyone, without unnecessary thinking.